Expertly-picked color combinations in one adorable clockpot... Hissyfit just cut my primping time in half and found a convenient way for me to tote by favorite shades 'round the clock. The Hissyfit Clockpots come in a range of shades and formulas for eyes, cheeks and face. Just open the top of the "pot" and choose the color combination that works for whatever time of day you are prepping for. 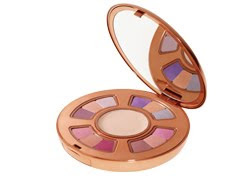 The gorgeous hues are designed to flatter any skin tone and are easy to apply. Face Clockpot features Hissyfit Saving Face Foundation and Highlight plus four powders so you can highlight, contour and glow all over for a flawless finish. Eye Clockpot offers a velvety primer and four eye-shadow trios to take you from work to play. And Cheek Clockpot comes with a soft sponge and four color duos to give you a subtle blush, rosy flush, bronzed hue or bold effect. Go to www.hissyfit.com to learn about more products that will simplify your life. Welcome to spring (we thought!) Between the cold air and dry heat, my hair's been having its ups and downs...or rather, more downs than ups. It's been craving moisture lately so you can imagine my panic when I reached for the conditioner in the shower and picked up a bottle of shampoo. Then another bottle of shampoo. Then another bottle of shampoo. They were all bottles of shampoo! No conditioner in sight. Just as I was about to call out to my husband and ask him to rummage through the beauty stash in search of conditioner, I saw it: A silvery marine blue tub of product nestled in the shower rack between the shaving cream and the loofah. I picked it up and--yes!--it was conditioner. After unscrewing the top, I scooped a goop and smoothed it through my hair, dispersing it throughout. It felt soft and creamy and my hair seemed to drink it up. After rinsing, my hair felt smooth and sleek again. And it even looked smooth and sleek after blow drying. Redken Nature's Rescue Cooling Deep Conditioner is ultra moisturizing and helps re-balance hair while cooling and soothing the scalp. What it's made of: A Sea Algae Hydracomplex, complete with sea algae to protect, soy protein to replenish, aloe vera to moisturize and oceanic calone for fragrance. Use daily after shampooing or after using Refining Sea Polish. For more info, go to www.redken.com.